Following on from last weeks post showing photos of my games room I thought that I would put up a couple of photos of my painting area, just for the sake of completeness. Not strictly a workbench I suppose, but whatever. 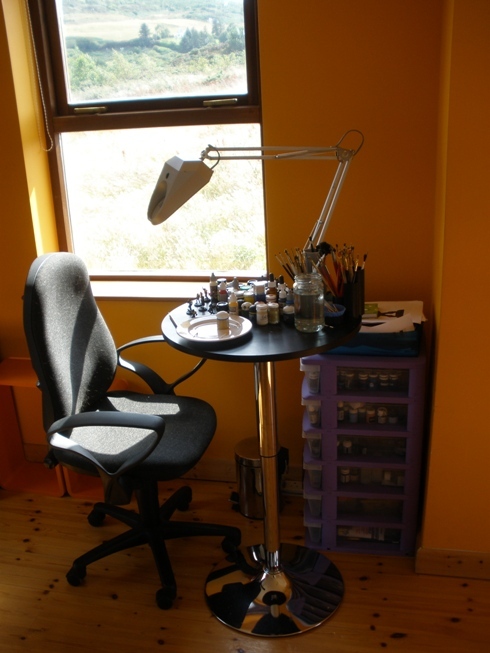 The slightly crooked picture above shows where I paint. I have natural light from the left for when I need it and the lamp for the rest of the time. Therefore earlier this year I bought the rather vulgar tall bar table thing shown in the first photo and the photo below. Its not the prettiest (I particularly dislike the chrome leg and the nasty plasticy look of the big honking lamp) but its functional. I intentionally chose a small table as while I work I slowly tend to cover all available space within arms reach with paraphenalia. If I physically limit the size of the work area then I am forced to tidy the clutter more often, so it doesnt get too badly out of control. 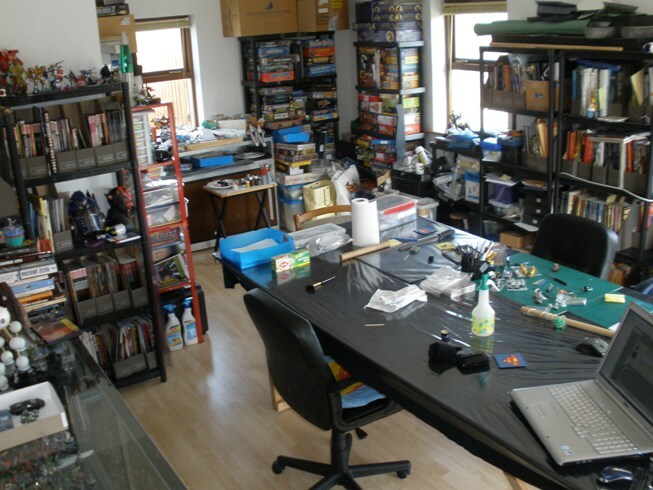 Clutter is definitely the worst thing about the hobby. Whether playing, painting or storing my hobby stuff, there is always clutter: its impossible to avoid, yet I still hate it. 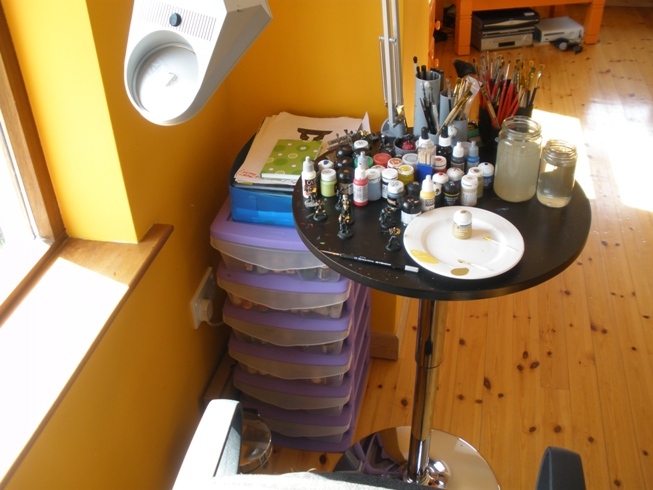 Alongside the table is the cheap plastic drawer set that I keep my paints in. Four drawers have paints in them and the other two have flock, PVA, transfers, varnish and some other odds and ends that are used when painting figures. 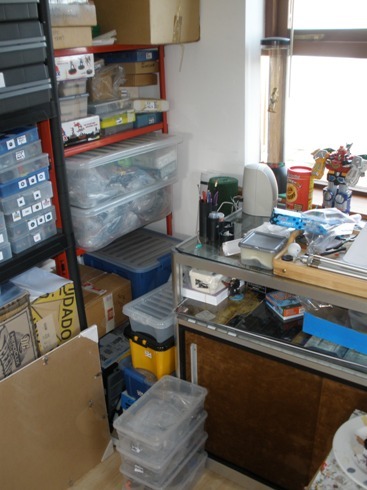 Glue, files, sandpaper and anything else to do with figure assembly and preparation are stored and used in the man cave. Its a functional space, but not a pretty one. 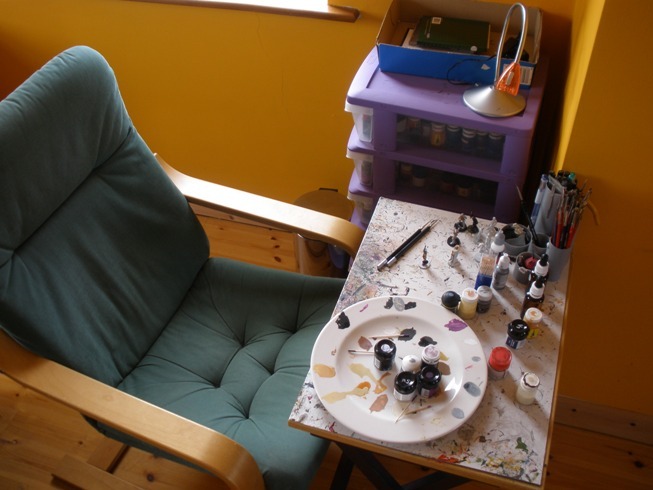 As my painting area is located in the living room we both see it every day whether I am painting or not, so I am currently on the lookout for ways to make it a bit easier on the eyes. 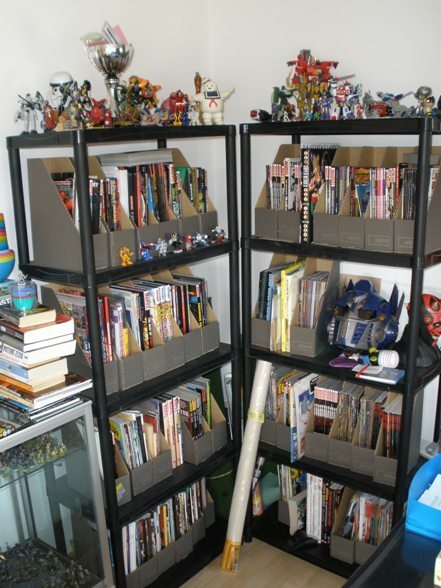 I may tackle the issue at the same time that I sort the Man Cave out properly, likely in September with a bit of luck. Donogh at Land War in Asia is running a fun competition. One of the criteria for entry is that I highlight three of the posts from his blog here. 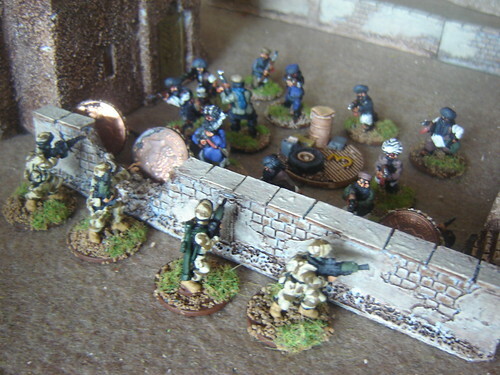 First up is a shot from a recent post about modern Afghanistan gaming. The only modern gaming that I do involves zombies, so its safe to say that I dont really game in the modern period. Its all cheesy sci-fi for me in one form or another. Therefore I think that its worth noting that this post grabbed me anyway. Mainly this was due to all of the nice details that are worked into the terrain. I like the numbered objective markers, the dusty, dirty die cast car and the like. The overall impression from the table is fantastic. Another desert game although this time its not set on this planet. Again it is the coherent look of the whole table that appeals to me. From the troops to the vehicles to the outcrops to the buildings all of the models look like a matching set. Although I have been pushing in that direction with my stuff for a while my tendency to flit around the place regarding my projects can often make for an less coherent look on the table than I would like. Therefore I am envious of Donoghs harmonised set-ups and enjoy checking them out. 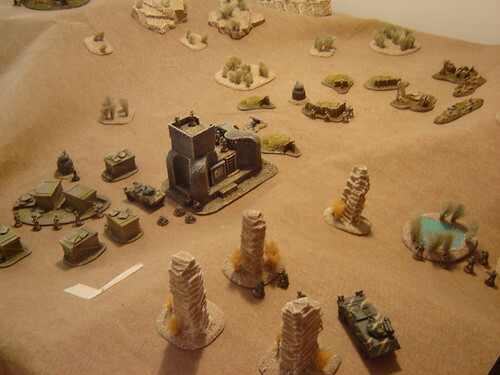 Lastly, the post illustrated by the image above shows the amount of work put in to one of the games set-up on LWiA. Its safe to say that I am the guy in my gaming group that drives things forward and generally does the majority of the prep work for our gaming. I dont tend to go into the detail shown above though, although it pleases me to see that some people do. I spotted some photos of fellow enthusiasts Man Caves in a couple of different places over the last few days and so I decided to put up a couple of photos of my toy room that I took last year. The shot above is taken from the corner of the room by the door. It shows the place in pretty much its normal state: not very messy but with a fair bit of work in progress stuff on the table. If anyone was bothered (which they arent) it would be possible to work out how mentally frazzled I am at any given time by examining the condition of that area. The state and density of the contents of that table is often analogous to my mental state at a given time. I am only half joking about this. The table itself is an 8 x 4′ sheet of MDF sitting on the bench that the carpenter put together to work on skirtings and banisters etc when the house was being built in 05/06. I asked him to leave it there as a stop gap until I got a “proper” table… which still hasnt happened. 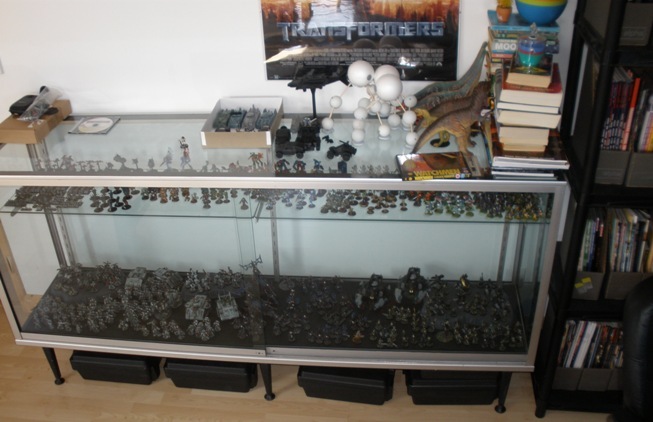 Another shot of the table with some ape, zombie and alien miniatures that I was working on roughly a year or so ago. 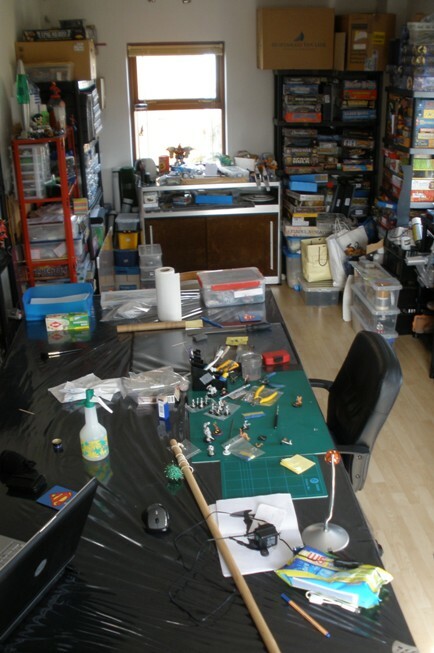 I do almost no miniature painting in the Man Cave although preparatory clean up and assembly work always takes place in here, along with the painting of terrain or vehicles and the like. Somewhat self evidently that table is where my tabletop and board gaming pursuits take place. The miniatures cabinet here was given to me for free by a redecorating florist, as long as I would take it away myself, which I did. I need to organise some more brackets and shelving for it at some stage. I reckon that I could get another two rows of shelves into it if I could work out who and where to go to to get the right bits and pieces. Maybe I might get around to it this autumn. There are lots of figures of various quality on show in that cabinet with my Sin Eaters Chaos Space Marine army on the bottom left and my Iacon Eldar on the bottom right. The top shelf has loads of stuff on it dating back as far as the mid eighties right up to a year or so ago. It consists of 6mm Epic stuff, Blood Bowl teams, some Elves, some Lizardmen, some Robots, some Grey aliens and loads of other bits and pieces. I have plenty more in storage too waiting for some more shelf space. The second smaller Ikea cabinet houses my more recent stuff. This photo is a year old now though, so its a bit out of date in terms of its content. This cabinet has worked out well and I plan to get one or two more along with more consistent shelving for the entire room later in the year. The boxes in the corner here contain some of my shamefully large unpainted lead mountain. The less said about that the better. Mostly comics on these shelves along with some of the assorted toys and Optimus Prime helmets and other bric a brac that dorks like me tend to accumulate for unclear reasons. 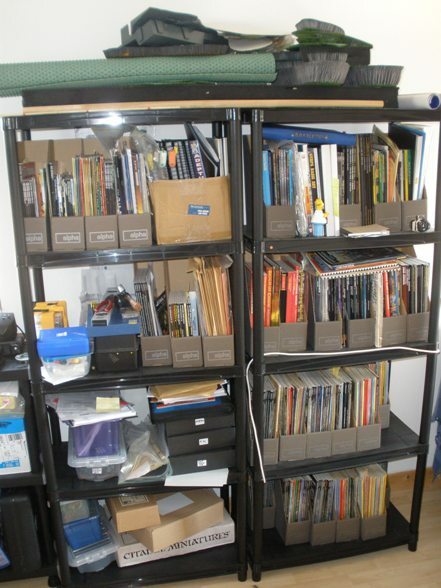 This set of shelves is largely rulebooks and game related magazines etc. It will become slightly neater once I reorganise the room in a month or two (after the now obligatory trip to Ikea). I have done a little work and reorganisation to the room since those photos were taken and I plan to do a large overhaul in the autumn. I will probably revisit this topic then. Weather permitting I should be able to get some photos of new stuff up by this time next week. I also have a weekend long session of the Judge Dredd Miniatures Game with MT and PB planned to start this Friday, so I will have a few photos of that too with a bit of luck. I dont normally put up video on this blog. I made an exception this time as I have had the miniatures for this project waiting to go for a while. Therefore I couldnt resist putting up this trailer while at the very early anticipatory stage of the miniatures project. I doubt that anyone will mind.